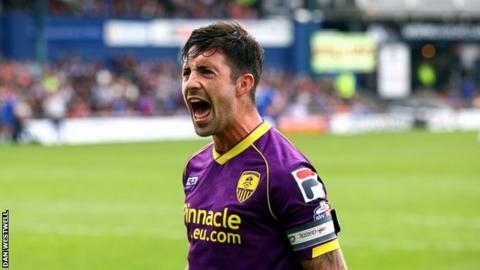 Alan Sheehan's equalising penalty secured Notts County's place in League One as they drew at 10-man Oldham. After a drab first half Adam Lockwood headed the Latics in front from a Gary Harkins free-kick. Notts levelled shortly after when Sheehan blasted home from the spot after Jonathan Grounds was penalised for handball in the box. Lockwood was then sent off for a second bookable offence as the Magpies secured their spot in the third tier. Oldham finish the season unbeaten in 10-games while Notts have avoided defeat in their final three matches. After a lacklustre first period the game came to life when Lockwood's looping header gave the hosts the lead. But with Notts on the brink they were awarded a penalty, which skipper Sheehan calmly blasted home. After being booked following the award of the spot-kick, Latics defender Lockwood was sent-off for a second bookable offence shortly after, allowing the visitors to see out the game and retain their League One status for a fifth consecutive season. "Today was a decent performance until, in my opinion, the referee gets involved and likes to enjoy the occasion more than the match. "I'd rather Shaun Derry [ Notts County manager] feel that tight than me - we were reasonably fluent at times in our football and there is no doubt it's due to the fact that we were not under pressure to go and win. "It was a good atmosphere, and a good game really." Notts County manager Shaun Derry talks to BBC Radio Nottingham following his side's 1-1 draw against Oldham. "Everybody since I came into the building [as manager in November] has been absolutely righty behind us - Greg [assistant Greg Abbott] and I can't thank everyone enough. "I don't want to take anything away from what we have achieved - it has been fantastic - but I don't want this situation again. It's horrible. I want us to work hard and it won't happen again. "This will be a great place to be next year - it is not always going to go sweetly, of course it won't, but it will be a much better place to play football than it was this year." Match ends, Oldham Athletic 1, Notts County 1. Second Half ends, Oldham Athletic 1, Notts County 1. Corner, Oldham Athletic. Conceded by Gary Liddle. Connor Brown (Oldham Athletic) wins a free kick on the left wing. Foul by Connor Brown (Oldham Athletic). Attempt saved. Charlie MacDonald (Oldham Athletic) right footed shot from the centre of the box is saved in the centre of the goal. Attempt saved. Callum McGregor (Notts County) left footed shot from outside the box is saved in the bottom left corner. Corner, Notts County. Conceded by Korey Smith. Corner, Notts County. Conceded by Paul Rachubka. Attempt saved. Ronan Murray (Notts County) left footed shot from outside the box is saved in the top left corner. Jamal Campbell-Ryce (Notts County) wins a free kick on the right wing. Foul by Gary Harkins (Oldham Athletic). Attempt missed. James Spencer (Notts County) right footed shot from the centre of the box is close, but misses to the left. Substitution, Oldham Athletic. Charlie MacDonald replaces Jonson Clarke-Harris. Attempt missed. Alan Sheehan (Notts County) right footed shot from outside the box is too high from a direct free kick. Second yellow card to Adam Lockwood (Oldham Athletic). Foul by Adam Lockwood (Oldham Athletic). James Spencer (Notts County) wins a free kick in the defensive half. Goal! Oldham Athletic 1, Notts County 1. Alan Sheehan (Notts County) converts the penalty with a left footed shot to the top right corner. Adam Lockwood (Oldham Athletic) is shown the yellow card. Penalty conceded by Jonathan Grounds (Oldham Athletic) with a hand ball in the penalty area. Substitution, Notts County. Callum McGregor replaces Mustapha Dumbuya. Attempt saved. James Dayton (Oldham Athletic) right footed shot from the right side of the box is saved in the centre of the goal. Substitution, Oldham Athletic. James Dayton replaces David Worrall. Substitution, Oldham Athletic. Joel Byrom replaces Danny Philliskirk. Goal! Oldham Athletic 1, Notts County 0. Adam Lockwood (Oldham Athletic) header from the centre of the box to the top left corner. Assisted by Gary Harkins with a cross following a set piece situation. Danny Philliskirk (Oldham Athletic) wins a free kick in the attacking half. Foul by Haydn Hollis (Notts County). Hand ball by Jonson Clarke-Harris (Oldham Athletic). Attempt saved. Danny Philliskirk (Oldham Athletic) header from the centre of the box is saved in the top centre of the goal. Corner, Oldham Athletic. Conceded by Jack Grealish. James Wilson (Oldham Athletic) wins a free kick on the right wing. Attempt missed. Gary Harkins (Oldham Athletic) right footed shot from long range on the left is too high from a direct free kick. Korey Smith (Oldham Athletic) wins a free kick on the left wing.